This is the best hybrid car for you if you believe in third chances. After two commercial duds dating back to model-year 2000, Honda relaunches its dedicated gas/electric car for 2019 as a compact four-door sedan. It has more conventional styling than either previous Insight and beats them for safety features. It rates an impressive 51/49/52 mpg city/highway/combined. And it’s affordable, starting at $23,725, including destination fee. The first-generation Insight debuted several months before the Toyota Prius. And oddly styled two-door subcompact hatchback, it used a three-cylinder gasoline engine and a small 10-kilowatt electric motor attached to the crankshaft. The tiny two-seater weighed less than 2,000 pounds and could be had with a manual transmission and no air conditioning. Converting its original EPA ratings to today’s formula, it rated 49/61/53 mpg city/highway/combined. Unfortunately for Honda, the Prius hybrid quickly stomped any sales momentum the original Insight might have gained. It was a more powerful, more practical four-door sedan, and still rated a laudable 42/41/41 mpg in today’s ratings. The first Insight was discontinued after the 2006 model year. Honda tried again with the second-generation Insight, launched as a 2010 model. Its four-door hatchback design was more Prius-like, right down to a rear liftgate with a visibility-obscuring bar splitting two glass panels. A bland driving experience and fuel economy that trailed that of the Prius doomed it out of the gate. It was discontinued in 2014 after Honda sold fewer than 70,000 over the course of its production run. Toyota sold more than 140,000 Prius cars in 2010 alone. Honda returns to the well for a third time with a 2019 Insight sized and styled like a sleeker Civic sedan and the nameplate’s best-ever driving experience by far. It still won’t topple Prius for hybrid sales supremacy but it’s more fun to drive and a worthwhile alternative if you’re turned off by the Toyota’s avant-garde look. 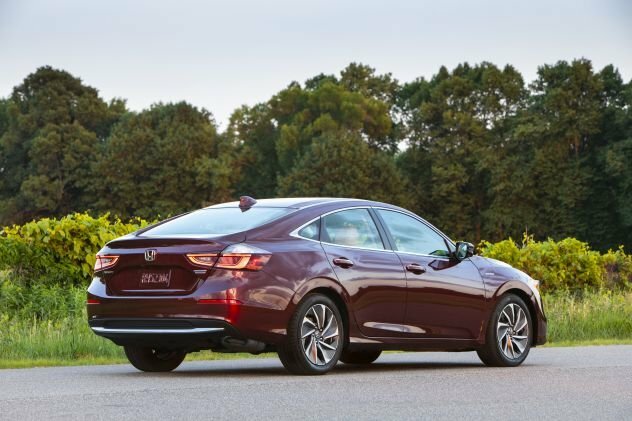 The ’19 Insight racked up more than 12,500 sales between its introduction in July 2018 and December 2018, a stronger pace than either of its forerunners. Buy a 2019. Unless one of its newly introduced vehicles is scorched by the press and scorned by the public, Honda doesn’t make changes for its second year. That’s not the case here. So, aside from maybe a new paint color or two — and perhaps higher asking prices — the 2020 Insight should be a re-run of the ’19. The model line shouldn’t change from 2019’s base LX, midline EX, and top-end Touring trims. Neither will a mechanical layout of front-wheel drive and Honda’s two-motor hybrid system that combines a gasoline four-cylinder engine with a 96-kilowatt battery-powered electric motor. Styling: The first-generation Insight was an engineering tour-de-force wrapped in rather goofy-looking sheetmetal. The second-generation probably borrowed too heavily from the Prius. For the 2019, designers took a more sensible route. The previous hatchback body style gives way to a traditional four-door sedan. The styling strikes a nice middle ground between conservative and futuristic, giving it broader appeal than the angular Prius. Some of the Civic’s more overdone elements are toned down, particularly in the back where the taillights look much more proportional to the rest of the design. Insight is about an inch longer overall than the Civic, but within fractions for other exterior and interior dimensions. The two cars share the same wheelbase (distance between the front and rear axles). They even have the same trunk volume. Insight’s cabin is straightforward and user-friendly. The instrument panel eschews modern convention by not including a central LCD screen that displays secondary information. Instead, those readouts can be customized within the digital power/battery charge meter that the car uses instead of a tachometer. It’s an elegant solution that can also be switched off if the driver so desires. All grades include a multi-angle rearview camera, but only EX and Touring have support for Apple CarPlay and Google Android Auto. The Touring also has a built-in GPS navigation system that doesn’t rely on a connected smartphone. The infotainment interface is easy to use and much more responsive to user input than even in some of Honda’s recent vehicles, such as the 2015-2016 CR-V compact crossover SUV. Its only significant drawback is that it sometimes tries to put too much information on the screen, which leads to situations where you can only cycle through four radio presets at a time. Our only other issue with the Insight’s interior is with its standard traffic-sign recognition system. It’s designed to read speed limit signs and project them onto the instrument panel. Several times during our evaluation, however, it did not correctly identify the posted speed limit. It also mistook black-on-white State Highway signs for speed limit ones. Fortunately, you can turn this function off. Passenger comfort mirrors that of the Civic, which is a good thing. Headroom and legroom are excellent, both front and rear. The seats are not designed for aggressive driving, but they do a good job of holding you in place if you need to make a quick lane change or emergency maneuver. Insight’s battery pack steals no trunk space, yielding an excellent 15.1 cubic feet in LX and EX, reduced to 14.7 in the Touring by presence of a subwoofer. Mechanical: Insight borrows much of its underskin architecture from the Civic, modified to accommodate the hybrid system’s electric motor, battery pack, and supporting technology. The gas engine is a 1.5-liter four-cylinder that produces 107 horsepower and 99 pound-feet of torque. The battery-powered electric motor is rated at 129 horsepower and 197 pound-feet. Combined horsepower is 151.5, according to Honda, and the company does not offer figures for overall torque output. The two-motor hybrid system allows Insight to run on the internal combustion engine, the electric motor, or both depending on driving demands. This isn’t a plug-in, so it can’t draw power from the electric grid. And it can travel for no more than a mile at low speeds solely on the battery. Transitions between gas and electric are almost completely seamless. The car doesn’t have a transmission in the traditional sense. Instead, Insight gets power to the pavement either directly from the gas engine or through a “traction motor” that gets assists from a generator and/or the battery pack. This setup saves weight and eliminates any power or fuel economy losses due to friction or fluid pumping. It’s an ingenious bit of engineering and a clever solution to help maximize fuel economy. Insight offers three drive modes, Eco, Normal, and Sport. There’s also an “EV” setting that will attempt to use the battery as much as possible, but over a longer term, this will cause the gas engine to work harder to maintain a charge. Most owners will want to keep it in Normal, as Eco dulls throttle response too much for our liking. Sport quickens response, but this could have an overly negative impact on fuel economy. The electric motor’s instant torque and the drivetrain’s direct connection to the front wheels allow the car to feel very responsive around town. There’s none of the “rubber banding” effect that can occur on other hybrid vehicles equipped with a continuously variable automatic transmission. It’s slightly less impressive on the highway, where the gas engine can occasionally struggle to keep up. It also emits an unpleasant drone when doing so. Insight is well-hushed otherwise. Handling response isn’t quite as sharp as in Honda’s conventional vehicles, such as the Civic or Accord, but it’s one of the better hybrids. Steering feel is dynamic, and it corners with excellent balance thanks to a low center of gravity afforded by the weight and location of the battery pack. Our review sample had no trouble coping with several inches of fresh snow that fell during our evaluation period. Features: Each Insight comes with a solid array of standard amenities. All include the Honda Sensing safety suite, which includes valuable driver-assistance technologies such as forward-collision warning, autonomous emergency braking, lane-departure alert with automatic steering correction, automatic high-beam headlights, and adaptive radar cruise control that can maintain a set following distance from traffic ahead. Also standard are full LED exterior lighting, push button engine start, and multi-angle rearview camera. EX adds CarPlay, Android Auto, keyless access, remote engine start, upgraded audio system, HD and satellite radio receivers, and an extra USB charging port. It also includes Honda’s LaneWatch, which is a camera mounted under the passenger-side exterior mirror. It projects an image on the infotainment screen of the view down the passenger side when the right turn signal is engaged or when the driver pushes a button on the end of the turn signal stalk. Touring grades get dual-zone automatic climate control, rain-sensing windshield wipers, LED fog lights, leather upholstery, heated power front seats, power sunroof, built-in WiFi hotspot, and imbedded navigation. Insight is priced quite attractively. Including Honda’s $895 destination fee, the 2019 LX is priced at $23,725, the EX at $24,955, and the Touring at $28,985. Per Honda tradition, there are no factory options. The only add-ons come in the form of dealer-supplied functional and dress-up accessories. The EX is the strongest value in this lineup. Though its price premium is rather stiff, the Touring offers many compelling upgrades. Insight’s EPA ratings are among the highest of any passenger car sold in the United States. LX and EX grades rate 55/49/52 mpg city/highway/combined. The Touring has a higher curb weight and lower-profile 17-inch wheels (LX and EX have 16s), so its ratings are 51/45/48 mpg. Our evaluation of a Touring model took place in the Chicago area during an especially cold January, and it averaged 34.9 mpg. Insight uses regular-grade 87-octane gasoline. Likely very little. Adding heated front seats to the EX would be nice. Otherwise, there isn’t much we would change. Insight is a comfortable and efficient sedan that offers a lot of features for the money. Any significant styling or content changes are unlikely before model-year 2022.